Most leaves and large items will pass right over the LeafBlox. Most small debris caught near the top of the brush will blow away or decompose through natural weather cycles. Your gutters will continue to flow, preventing home damage and keeping you off the roof! Virtually maintenance free and will not void roof warranty. Most snow guards will hold back the majority of snow and ice on slick, glossy coated, sloped roofs so the frozen mass can melt or safely release in very small pieces. When used in conjunction with our guards, the LeafBlox will act as an iceguard to reduce winter gutter congestion, ice daming and icicles. The black UV treated polypropylene bristles absorb heat on sunny days which in turn accelerates the snow and ice melting process along the gutter to minimize buildup. In winter climates, the combination of snow guards and Leafblox assure property and pedestrians below will be safe and water will flow away from the structure as intended. * All types of gutter guards allow some debris to enter gutters and may require limited maintenance. That's why Contractors and Home Improvement experts consistently favor our system which is easy to install & remove. Easy to Install - Simply insert LeafBlox into your gutters from end to end. 2. 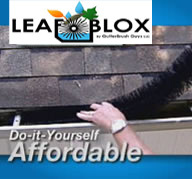 Place the LeafBlox end to end into your gutters. That's it! No tools required and no gutter or roof modifications are necessary. 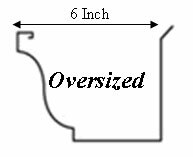 No other gutter system this effective is this easy to install.